Rourkela is one of the beautiful and the second largest city of odisha which was brought into light only in 1955 after the onset of steel plants.Rourkela tops the list of holding the name of housing the modern and the largest steel plants of India. It works on an Indo-German based collaboration and is owned by the Steel Authority of India. This place is very famous for education for it imparts the best in the field of technology with institutes like National Institute of Technology (NIT).Another important feature of this city is its hundred percent literacy rate. Though the name Rorkela means "our village", the place has travelled miles away from the impression of village. Rourkela is located at 84.54E longitude and 22.12N latitude in Sundergarh district of odisha at an elevation of about 219 meters above mean sea level. History states that Rourkela was initially occupied by a tribal community called "Raulia" from whom the village got its name. It was only in 1931 after the declaration of a small area as an urban town Rourkela started picking up its status with a primary school, an office of the forester, a sub-post office, some tea stalls and restaurants. Gradually a train line was connected to Birmitrapur and Rourkela could avail a status of a junction and the number of railway employees also started increasing. After this slowly different companies from different parts of the country started involving themselves in the constructing the steel plant. Dussera is celebrated for 10 days from September end to early October which is the celebration of triumph of good over evil. Huge effigies Ravana, his brother and son are burnt. On the last day, with the accompaniment of a band, colorfully bedecked elephants carrying the statue of the god. The heart of the town has a 75-feet tall standing statue of Hanuman designed by Sri Laxmana Swami which is one of the appreciated tourists attraction of Rourkela.The vicinity of this temple also houses other temples like Santoshi Ma Mandira, Bruhat Sivalinga Mandira and Ram Daravar.This temple is surrounded by a beautiful garden. The presiding deities of Maa Vaishno Devi temple Goddess Kali, Goddess Lakshami and Goddess Saraswati.This temple which is situated on top of a hill with a scenic beauty of the city around gives the place a heavenly feeling. This temple which is situated in the Sector 3 at Rourkela houses the deities of Lord Jagannath, Balabhadra and Maa Subhadra and it was built in the 1975. This temple is constructed in the village of Badagoan which is about nearly 70 kms from Rourkela.A major festival called as Bhopal takes place every year in the month of Pausa where people from different parts of the state especially from the Gond community takes part. 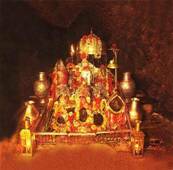 The Rani Sati Temple is situated at Birmitrapur and is also popularly known as second Jhun-Jhun Dham of India. The temple is beautifully designed and the work done on the walls are appreciating. 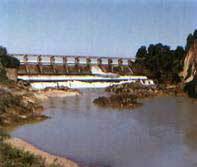 Mandira dam which is built across the Sankha River is situated at a distance of about 25 kms from Rourkela.The main purpose of construction of this dam is to supply water to the nearby villages. This dam is very much ideal for a picnic for it also entertains by boat rides. 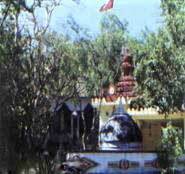 Vedavyas is a very famous spot in Rourkela for it is from here where Maharishi Vyas wrote "Mahabharata". It is often subtly attractive for it is located at influence of the rivers Shankha, Koel and Saraswati.Apart from its natural beauty this place also offers other attraction like vedic ashram. Junagarh houses an ancient fort which talks a lot about the history and archeology of this place.Located at a distance of 4 kms from Hemagiri it has some caves embracing signs of "tantra" worship. 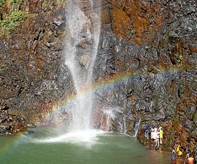 Rourkela has the fourth highest waterfall in India which falls from a height of 244mt.This beautiful waterfall is situated at a distance of about 114 kms from Rourkela.This waterfall gets its root from the perennial Korapani Nala. Darjeeng is a very famous picnic spot for the people of Rourkela and is at a distance of about 51 km from Rourkela. This s very small dam which is a busy place for weekend outings. Though there is no major tourist attraction Rajgangpur houses the famous cement factory. This popular picnic spot is at a distance of 27kms from Rourkela and on the river Ib.A naturally formed Siva Lingam of black granite worshipped by the local people, is an additional attraction. 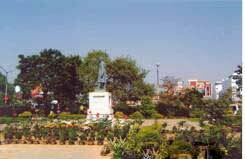 There is nothing specific to shop in Rourkela for it is more of an industrial area. The city is known internationally for iron & steel trades. Recent upspurt in iron & steel pricing has seen a lot of industries of all sizes coming in and around Rourkela. The city is near to the source of Raw Materials. It is situated on the Kolkata-Mumbai South Eastern railway line which is a major route connecting the two metros of India. Rourkela is directly connected to Ahmedabad (www.odisha-ahm.org), Bangalore, Bhubaneswar, Chennai, Cuttack, Delhi, Bilaspur, Mumbai, Nagpur, Pune, Puri, Patna, Kolkata, Raipur, Ranchi, Sambalpur, Vishakhapatnam and many more cities of India. And very soon a Garib Rath Express is going to ply between Ranchi and Bhubaneswar via Rourkela. Rourkela is connected to various towns of the state by State Highway 10 and National Highway 23. National Highway 23 connects it to the nearby city of Ranchi which is the capital of Jharkhand state. Interstate buses ply between Rourkela, Ranchi, Bhilai, Jamshedpur. Several buses ply between the major cities and towns of the state.